Cavs versus Warriors on MLK Day! On Martin Luther King Day, the Golden State Warriors host the Cleveland Cavaliers in their final NBA Regular Season match at Oracle Arena. 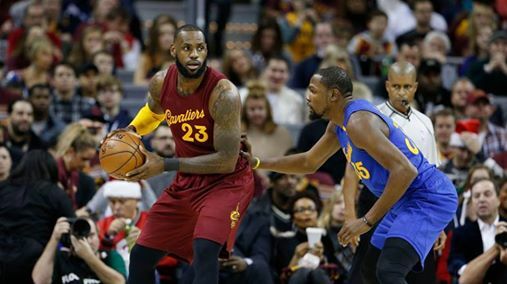 The warriors are trying to end their 4 consecutive losing skid at the hands of the Cavaliers, while the Cavs are trying to extend their winning streak against the Dubs which dated back at 2015 – 2016 NBA Finals. The last time that these two teams met when into a controversial officiating by the referee, where Kevin Durant stumble down the floor after Richard Jefferson steps on Durant’s feet that eventually caused the Warriors to lose the game in an exciting down the wire where the Cavaliers prevail. Currently , both teams are leading their different conferences, the Warriors lead the west in standing with 34 wins and 6 loss, while the Cavs in the east has 29 wins and 10 losses. The Dubs are on a 3 game winning streak while the Cavs finally won a game against the Sacramento Kings after losing back to back games in Utah and Portland. For the Warriors to win, the reigning 2 time MVP Stephen Curry must step up and shows that he is still the best player in today’s NBA? And Kevin Durant must show from start to finish unlike his very first meeting with the Cavs where Durant fade away in the 4th quarter. And for the Cavaliers to win, LeBron James must continue his facilitator with his team, efficient 3 point shooting of the team, especially with the new addition of Kyle Korver that match the 3 point shooting of the Warriors and lastly Kyrie Irving presence in the game especially if the game goes down the wire, Irving has been the kryptonite of the Golden State Warriors. Who do you think will win in their final match in 2016 -2017 NBA Regular Season? Will the Cavaliers extend their win to 5 straight against the Warriors or the Warriors finally beat the Cavs? No Comment to " Cavs versus Warriors on MLK Day! "